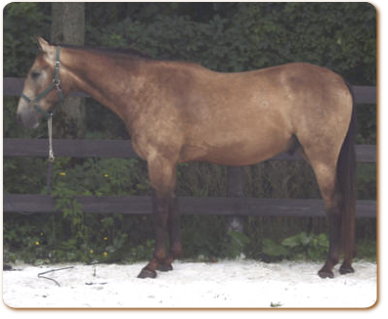 Bronze Motivation (barn name Bronski) is a buckskin gelding Thoroughbred cross born May 6 2007. He is out of Matt's A Motivation ( a Matt's Scooter daughter) and by Guaranteed Gold. Bronski is well put together with the conformation and movement for the hunter field. Bronze Motivation is an extremely friendly horse and is willing to please and has proven to have a great work attitude so far.. Bronze Motivation is registered with the Canadian Sport Horse Association.